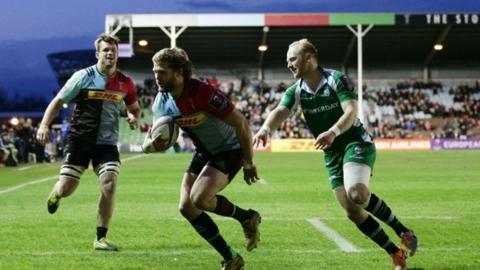 Harlequins ran in five tries as they came from behind to beat London Irish in the European Challenge Cup quarter-final on home soil at The Stoop. England scrum-half Danny Care claimed a hat-trick, while loose forward Luke Wallace crossed twice as Quins booked a home semi-final against Grenoble. But Quins were given a real scare, not reclaiming the lead until late on. Irish ran in three tries through winger Fergus Mulchrone, scrum-half Brendan McKibbin and centre Sean Maitland. And the visitors put in a spirited display that bodes well for next weekend's 11th v 12th relegation battle at Newcastle. Irish and Quins are due to meet again at the Madejski Stadium on Sunday 1 May, on the penultimate weekend of the season. But the Exiles first face an even more crucial test next weekend in that crunch meeting with the Falcons on the artificial pitch at Kingston Park. Grenoble reached the last four with a 33-32 win over Connaght, while Montpellier, who beat Sale on Friday night, will play Newport Gwent Dragons, who put out holders Gloucester, in the other semi. "We'll take the result. We're in a semi-final. We're the only English side left in the competition. We scored 20 unanswered points to come back from 30-18 down. "They had the freedom to play and we probably had that little bit of weight of expectation. It was up and down, but we scored some decisive points when the pressure was on." "We're really proud of the way the players performed. It was always going to be a tough task coming here. Harlequins are a pretty strong side who've been playing well throughout the year. "We got our noses in front and, if we could have held in there a little bit longer when we were two scores up, it could have been a different night. "But, we're hugely proud of the way the boys played and we're really hoping they can play with that freedom in the weeks to come before the end of the season." Harlequins: Brown; Yarde, Lowe, Roberts, Visser; Botica, Care (capt); Lambert, Gray, A Jones, Merrick, Twomey, Robshaw, Wallace, Clifford. Replacements: Ward, O Evans, Sinckler, Matthews, Luamanu, Dickson, Marchant, Chisholm. London Irish: Fenby; Maitland, Mulchrone, Brophy-Clews, Fowlie; Geraghty, McKibbin; Smallbone, Paice (capt), Halavatau, Lloyd, Sinclair, Guest, Trayfoot, McCusker. Replacements: Cruse, Court, Palframan, Curry, Sisi, Ellis, Allinson, Steele.